While volunteering at a women's group in Ghana director Gabrielle Zilkha began to feel lonely for her Jewish roots. Not because she was ever particularly religious but because being alone in Africa she felt that she didn't even have the option. Her mother hearing of her plight tells her about a community a days travel away where there is supposed to be a group of centuries old practicing Jews. Making the trip she finds a ancient community who until relatively recently didn't know that they were part of a larger religion. Good but kind of fluffy tale of one woman reconnecting with her own heritage by discovering it some where else. This is an intriguing tale full of lots of good people and some rather interesting questions. 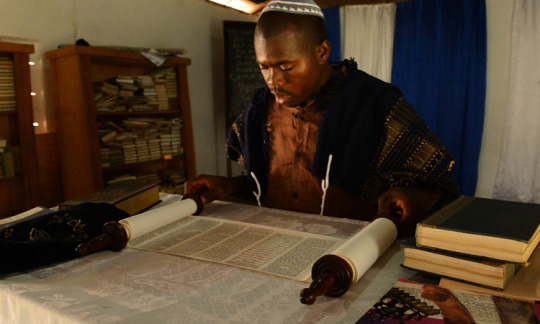 While I had heard of various Jewish communities being found in Africa I had never heard of this one and I was enraptured by the history of the tale. The problem with the film, and hence the fluffy description, is that Zilkha takes a splashy kind of jokey attitude toward the making of the film with lots of shots that were clearly staged, showy wipes, knowing narration and light sense that make it hard to take the whole thing seriously. Personally I found the whole subject fascinating but I wasn't always so keen on the presentation. I get the feeling that she shot most of the documentary footage and interview material and then went back and shot linking material. I suspect this because some stuff was obvious shot by one person while a lot of the stuff I didn't like was clearly shot by a second camera. While I truly love the story I only really like the film because the film doesn't quite seem to have a hard enough edge to it. Regardless DOING JEWISH is recommended when the film plays Wednesday the 11th at the New York Jewish Film Festival.